Eggplant. Are you a fan? Some people are not. And in a way, I understand. Undercooked eggplant is one of the most unpleasant things to eat. And overcooked eggplant is just mushy. But there is so much one can do with eggplant to make it taste fantastic, it's just so very versatile! You can smoke it and make baba ganoush (eggplant tahini dip), you can fry it, bake it, braise it. But my favorite way is to bread it: it creates an amazing chewy texture that fulfills my crispy chewy, dare I say it, junk-foodie craving. But it's actually good for you -- it's not deep fried and is still crispy (!) and the breading batter is made from whole grain flour! I just love the flavor and especially the texture, and you can use it in many forms- in a sandwich (eggplant-parm-sub), atop a salad, with pasta, or alone with good old ketchup or marinara sauce on the side. You could eat it with tartar sauce and mushy peas. Or like a schnitzel too! I'm kind of obsessed with this and always make extra! 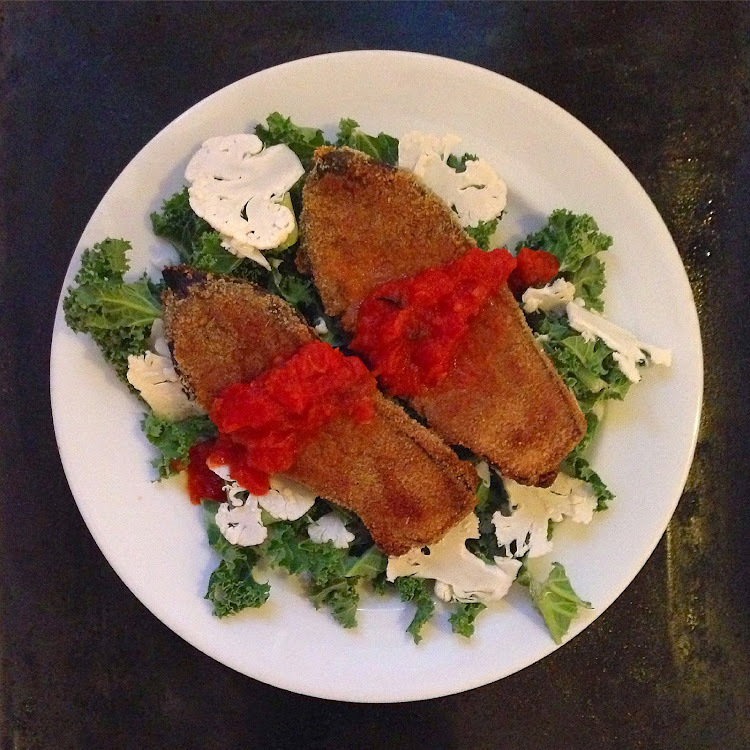 This method is inspired by Oh She Glows- Angela really created something brilliant with dipping eggplant in a flour batter and then in bread crumbs to achieve crispy perfection. I kid you not that this is the best way to eat eggplant, so crispy and delicious and satisfying, you really feel like you're eating a treat, (even though it's quite healthy!) and that's what it's all about! So try it for yourself and then tell me you agree! 1. Place the eggplant on a wire rack and sprinkle with salt. Allow to sit for about 30 minutes or until it starts to sweat. Wipe off the sweat with a paper towel. 2. In a shallow plate, mix the spelt flour, salt and water together. 3. In another shallow plate, mix the breadcrumbs, polenta, nutritional yeast, herbs de Provence, chili powder and black pepper together. 4. Preheat the oven to 400F or 200C. On a parchment paper-lined baking tray, drizzle 3 tablespoons of oil. Dip each eggplant in batter and shake to remove excess, then dip in bread crumbs, shake off excess and place on the greased baking tray. Repeat with the rest. 5. Bake for 10-15 minutes until golden on the bottom, then drizzle each eggplant with a little oil and flip. Bake for another 10 minutes or until nicely golden brown. 6. While the eggplant is in the oven, make the marinara: heat extra virgin olive oil on low heat and add the garlic and cook for 20 seconds, along with oregano and chili flakes. Then add the tomatoes and their juices and grated carrot and allow it to simmer on low heat until thickened. Salt to taste. Tear in basil at the end. Serve immediately and freeze any extras! Enjoy with a bed of kale, cauliflower and marinara sauce. And also spaghetti dressed in marinara sauce if you'd like.